Sunday marked the official end of yet another entertaining football season. So, slowly but surely, fans will swing their attention over to college basketball, which is set to take the main stage as conference races tighten and the NCAA Tournament inches closer and closer. If the first two-thirds of the season were any indication, the last two months should be compelling, dramatic and full of twists and turns. Seven of the top-10 teams have lost in the last two weeks, and pinpointing a favorite down the stretch seems more difficult than trying to contain Tom Brady in the pocket. So what have you missed? Who are the favorites to win the title? What players do you need to know? We have you covered. There hasn’t been a dominant team in college basketball this season. Parity in college basketball is very much alive and well, which could make for a more unpredictable tournament than normal. At least 12 teams have a legitimate chance at winning a national championship, in my view. That said, there are a few teams with better shots out of that group. There are five teams I would, as of today, take against the field — Villanova, Kansas, Louisville, Oregon and North Carolina. Each of those five has a hole of some sort, but so does everyone else. If I wrote this story last week, I would have put Arizona on that list, but the beat down it took at Oregon made it an insecure selection. 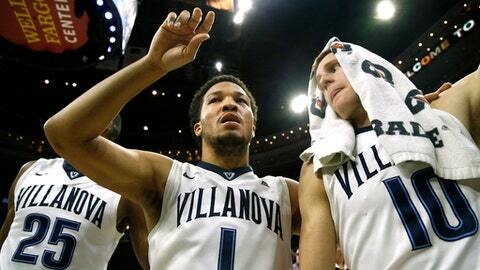 Villanova: Much like Drake, Villanova is trying to go back-to-back. At this point, I think the Wildcats have as good a shot as anyone to win the title. Jay Wright has a fairly short rotation, but it’s full of guys that understand their roles. Josh Hart is a co-favorite to win Player of the Year, but he’s flanked by veteran Kris Jenkins, ever-improving Jalen Brunson and a defensive force in Mikal Bridges. Kansas: Talented guards win in the NCAA Tournament (examples: Tyus Jones, Kemba Walker, Russ Smith … I could go on). And that’s something Kansas has plenty of. Frank Mason is a co-favorite for Player of the Year (more on him below) and Devonte’ Graham is impressive in his own right. Throw in how Kansas is playing with Josh Jackson as a mismatch nightmare at the four-spot and the Jayhawks will be a tough out in March. 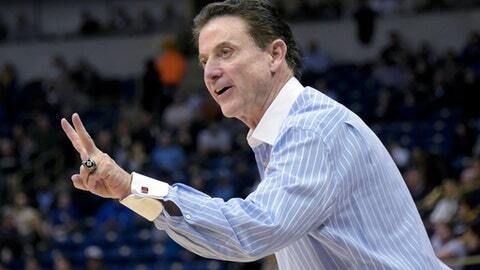 Louisville: Rick Pitino’s teams routinely peak at the right time. The Cardinals, despite injury issues at the point guard spot, are playing their best basketball of the season. They have extreme length on the perimeter, and their wings are playing at a high level. They are also getting outstanding play from sophomore Donovan Mitchell, who has connected on 14 of his last 27 three-point attempts. 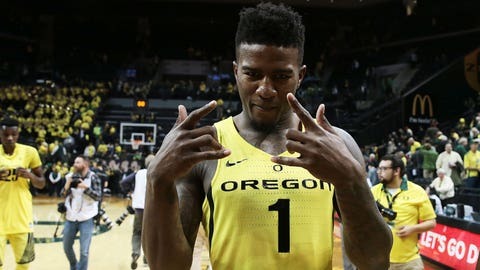 Oregon: Anyone who watched Oregon’s dismantling of Arizona over the weekend certainly knows what the Ducks are capable of. Dillon Brooks is starting to hit his stride and that’s a scary thought for the Ducks’ opponents. Oregon has won 19 of its last 20 games and has two top-five wins in that span. The Ducks have another big test coming on Saturday when they travel to UCLA. North Carolina: I like this North Carolina team to make a deep run in the NCAA Tournament because of its mix of veteran players, ability to rebound and the continued development of Justin Jackson on the perimeter. Jackson has scored 20 or more points in six of UNC’s last 10 games. The Tar Heels also have a gifted lead guard in Joel Berry and a trio of post players that can impact the game, especially on offense. It was supposed to be a dominant season for Mike Krzyzewski and the Duke Blue Devils. 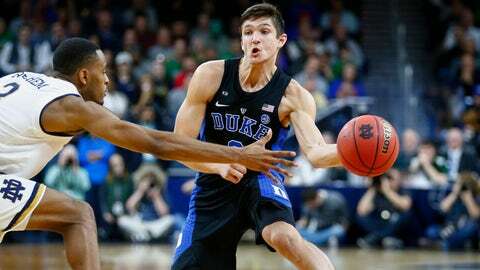 They entered the year with the most incoming talent and a mix of proven veterans, including potential Player of the Year candidate Grayson Allen. But things don’t always go as planned, and Duke’s season certainly hasn’t. It started with Harry Giles, Jayson Tatum and Marques Bolden — all top 10 recruits — missing a chunk of games with injuries. Giles had an arthroscopic surgery in the fall and returned after missing 11 games. Tatum and Bolden each missed the first eight games of the year. Then Allen’s Tripgate began just before Christmas and he was hit with an indefinite (read: one-game) suspension. Krzyzewski then was forced to leave the team for four weeks due to back surgery to remove a fragment of a herniated disc. If that wasn’t enough, the Blue Devils were without Amile Jefferson in the middle of January for games against Florida State and Louisville. They lost both. But now, for what seems like the first time all season, Duke has everyone back. Coach K returned to the sidelines and the team finally appears to be healthy. The Devils are also riding a three-game winning streak and playing as well as they have all year. At times this season, Duke players haven’t been on the same page, but there was a noticeable difference watching the Blue Devils knock off Notre Dame on the road last week. So the question remains: Can Duke overcome the drama, injuries and setbacks? It certainly has the talent to do so. We’ll know a lot more about this Duke team over the next two weeks, as it faces off against No. 8 North Carolina and No. 12 Virginia. Speaking of talent, Kentucky, like Duke, has no shortage of it. And like Duke, the Wildcats have had their rough patches this season. In fact, they are right in the midst of it. After starting the season 17-2, John Calipari’s team has dropped three of the last four, including a loss at Tennessee. Now losses to Kansas and at Florida aren’t necessarily anything to get to nitpicky about, but it’s more the way the Wildcats lost to Florida (a 22-point rout), were taken to overtime by Georgia and looked out of sync at times against Tennessee. Early in the year, Kentucky took care of the ball and relied heavily on Malik Monk and De’Aaron Fox to push it to the finish line. And that’s exactly what they did. But over the last four games, Kentucky is averaging nearly 15 turnovers and has six more giveaways than assists. That’s not a recipe for success. Outside of the UT game, which he basically won for them scoring 37 including the bucket that sent it to overtime, Monk has struggled in the stretch, going a combined 17 of 46 from the field in the other three games. But you can’t blame Monk for UK’s current woes. He’s been terrific for much of the season and off shooting nights are going to happen. The real issue could be that they rely on him too much. If Kentucky is going to make a deep run come tournament time, and it’s certainly very much a real possibility, it needs someone outside of its top four — Monk, Fox, Isaiah Briscoe and Edrice Adebayo — to step up and play consistent. The Cats start a fairly soft part of their schedule on Tuesday, so it’s a good time for them to get back on track and gain confidence. This was supposed to be the year of the freshman. In some ways, it’s lived up to the hype and in others, I’m not sure it has. Regardless, there are a number of gifted first-year players that are showing up for their respective team. Who are the five playing the best (in no particular order)? 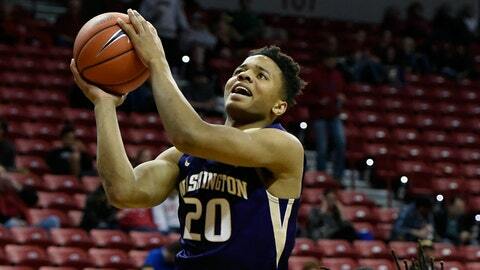 Markelle Fultz, Washington: The Huskies won’t make the NCAA Tournament, barring a miracle in Las Vegas at the Pac-12 tournament. So if you haven’t watched Fultz yet, make sure you do. Fultz is a dynamic playmaker and athlete. He’s averaging 23.2 points, six rebounds and six assists a game, while shooting 42 percent from three. Fultz is the current favorite for the No. 1 pick in the 2017 NBA Draft. 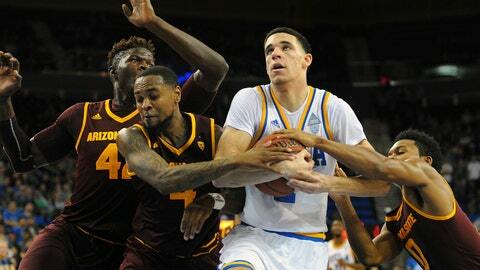 Lonzo Ball, UCLA: You could make a case that Lonzo Ball is more important to his team than any player in the country. The culture at UCLA shifted quickly with the play of him and freshman teammate T.J. Leaf. Ball’s passing and unselfish style of play is contagious, plus he’s shown a major improvement in his ability to make 3-pointers. He’s not only the favorite for Freshman of the Year, but also a candidate for Player of the Year. 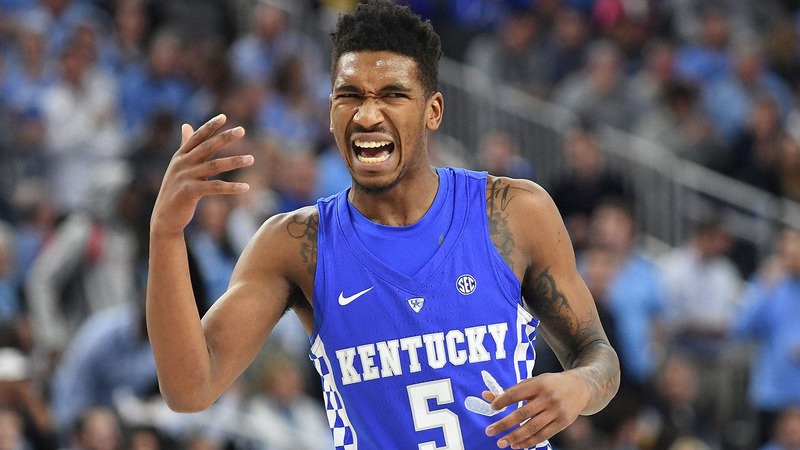 Malik Monk, Kentucky: In case his 47-point outburst against North Carolina wasn’t enough, Monk strapped the Cats on his back against Georgia, scoring 37 and hitting the game-tying jump shot to force overtime. Monk has scored in double figures for UK every game this season and is averaging 21.9 points per game, while shooting 41 percent from three. Dennis Smith, NC State: Although NC State has struggled since the start of ACC play, Smith has been a constant for the Wolfpack, scoring 19.2 points and seven assists a game. Smith is an electric playmaker at the point guard spot and can impact a game with his scoring or distributing. Josh Jackson, Kansas: Slowly but surely, Jackson, a 6-foot-7 wing has turned things up a notch in Lawrence. Jackson has scored 20 or more points in three of Kansas’ last five games and it just so happened to be against Baylor, Kentucky and West Virginia. The bigger the game, the better Jackson plays. The Player of the Year race is starting to take shape. There are a host of names in the conversation like Ball or Purdue’s Mr. Double-Double Caleb Swanigan, but the clear frontrunners, at least in my eyes, are Kansas’ Mason and Villanova’s Josh Hart. Mason has scored 30 or more points for Kansas three times this season and is averaging a ridiculous 20.4 points, 5.2 assists and 4.3 rebounds. He’s improved his shooting from last year, as he’s shooting 52 percent from three on 106 attempts. 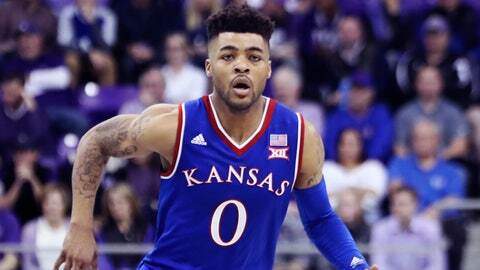 Mason is the undisputed leader of Kansas, a title contender, and his impact is felt on not only offense, but defensively too. His speed and toughness are game-changing for the Jayhawks. Hart is what makes Villanova tick. A stat-sheet stuffer, Hart averages 18.9 points, 6.6 rebounds and 3.4 assists a game. Jay Wright told FOX Sports that he’s a “complete player.” Much like Mason, Hart has improved as a shooter and is making three-point shots at a 40-percent clip. His presence is felt on defense as well, as opposing Big East coaches rave about Hart’s defense and the overall impact he has for them on that end of the floor. Injuries are part of sports, unfortunately, and this college basketball season has been riddled with the season-ending variety, impacting some potential title teams. 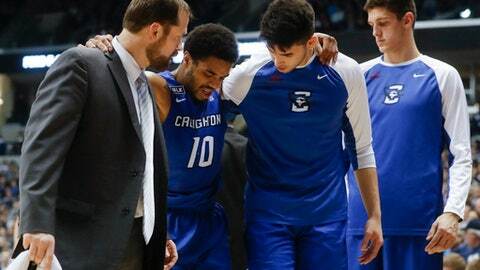 Creighton lost star point guard Maurice Watson, who led the NCAA in assists, to an ACL injury. The Bluejays were 18-1 when he went down. Similarly, Xavier lost Edmond Sumner to an ACL tear less than two weeks after Watson was injured against the Musketeers. Indiana lost OG Anunoby, who had played his way into the NBA Draft lottery conversations, to a torn ACL, after Collin Hartman went down in the fall due to an undisclosed knee injury. The Hoosiers are also currently playing without star guard James Blackmon. Connecticut lost star freshman Alterique Gilbert for the year with a shoulder injury, as well as VCU transfer and starter Terry Larrier to an ACL injury. Michigan State lost both Ben Carter and Gavin Schilling to non-contact knee injuries before the season started. Other season-ending injuries include Udoka Azubuike (Kansas), Keita Bates-Diop (Ohio State) and Dwayne Morgan (UNLV). Gonzaga is currently ranked as the nation’s No. 1 team and also happens to be the only undefeated team in the country. And the Bulldogs will likely stay that way, at least until the NCAA Tournament when they are truly tested. 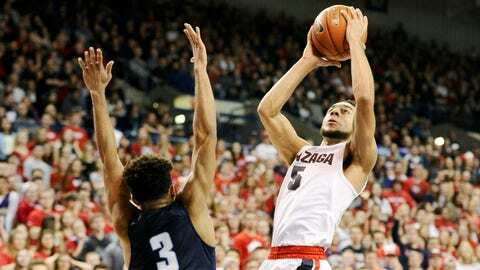 Thus far, Gonzaga is torching the West Coast Conference, winning by more than 25 points a game in the league. If the Bulldogs are going to get beat in the regular season, it’s likely going to be by Saint Mary’s. The Gaels are 21-2 and regarded as one of the nation’s top shooting teams. The answer to that question will come on Saturday, when the Zags and Gaels tangle in Moraga. The last matchup was built up as a heavyweight battle, only for Mark Few’s bunch to win by 23 points at home. The only other team in the WCC that could knock off the Bulldogs in the regular season or in the WCC tournament would be BYU, who is loaded with skilled players and shot makers. But Gonzaga already went to Provo and won. The Cougars will close the season out at the Kennel on Feb. 25. With all that said, I think it’s likely the Bulldogs sweep the competition and enter the NCAA Tournament undefeated and as a No. 1 seed. 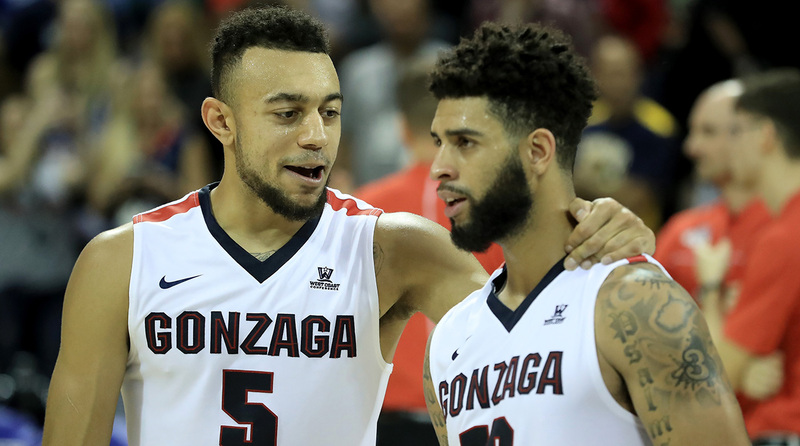 Gonzaga has a deep, versatile roster full of gifted transfers (Nigel Williams-Goss, Jordan Mathews and Johnathan Williams), a beefy, productive post player in Przemek Karnowski and an emerging freshman in Zach Collins. I’m not sold they’ll make the Final Four, but this certainly seems like Few’s best chance. This is a well-balanced group that excels on both ends of the floor. Gonzaga ranks No. 4 in KenPom’s adjusted efficiency in both offense and defense, while having the No. 1 defensive effective field-goal percentage in the country. Louisville at North Carolina, Feb. 22 — Historically, Roy Williams teams get better late in the season, much like the Cardinals do, so this showdown should be a doozy. Both teams are entering February trending in the right direction and this game should be an up-and-down affair between a pair of teams that could end up at the Final Four. 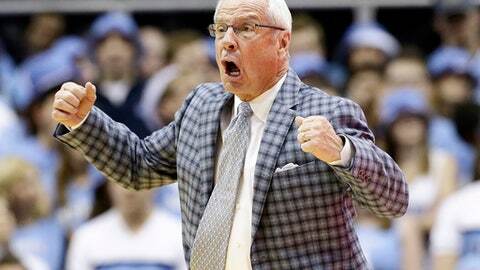 Duke vs. North Carolina, Feb. 9 and March 4 — This is somewhat self-explanatory. Anytime the Tar Heels and Blue Devils go head-to-head, it’s must-see television. This year is no different. Gonzaga at Saint Mary’s, Feb. 11 — As mentioned above, if Gonzaga is going to lose in the regular season, this is the biggest chance for it. McKeon Pavilion will be rocking and Randy Bennett will be looking for big performances for Jock Landale, Calvin Hermanson and Emmett Naar. The Gaels are 11-1 in the league, so a victory would really shake things up in the WCC. Villanova at Xavier, Feb. 11 — Xavier took a beating at Villanova on Jan. 10, but the Musketeers have a chance at redemption in the Cintas Center this weekend. After losing three of four, Xavier has reeled off three straight and it should be four heading into Saturday, assuming it takes care of business against DePaul. Xavier is currently in second place in the Big East standings and a win against the defending champs could go a long way. Oregon at UCLA, Feb. 9 — I was going to choose the UCLA at Arizona game in this spot, but the game Thursday could have more league-title implications. Oregon and Arizona are currently 10-1 in the league, with the Ducks holding the edge over the Wildcats with the head-to-head win. The Bruins are 8-3 in the league and if they are going to get back in the hunt for a regular-season title, they’ll need to knock off the Ducks at home.